Sandi Ball began her belly dance journey in 1998 when she attended classes at FatChanceBellyDance® with a friend, not knowing what it was or what her future held with it. As a continuation of her university degree in sculpture and with a love for puzzles, American Tribal Style® belly dance satisfied her need for versatility, improvisation and efficiency – creating art in movement. A keen eye for detail, artistry and teamwork has aided her journey through the roles of student, performer, troupe member, teacher, and mentor. 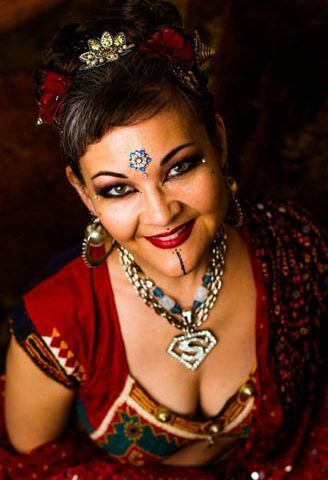 She has over 13 years in experience as a teacher and performer for FCBD® and continues to share her experience as a FCBD® Instructor, Emerita with performance collaborations, classes and workshops local to San Francisco and worldwide. When not in her belly dance role, she is a pet sitter in the San Francisco bay area and the maker of HiBeam Bindis, as well as other accessories. For more info, please visit www.sandisocean.com.